Brought together by fate and bound by a misfiring spell, three unlikely heroes have to work together against warring factions as they try to fix an ever increasing number of problems. 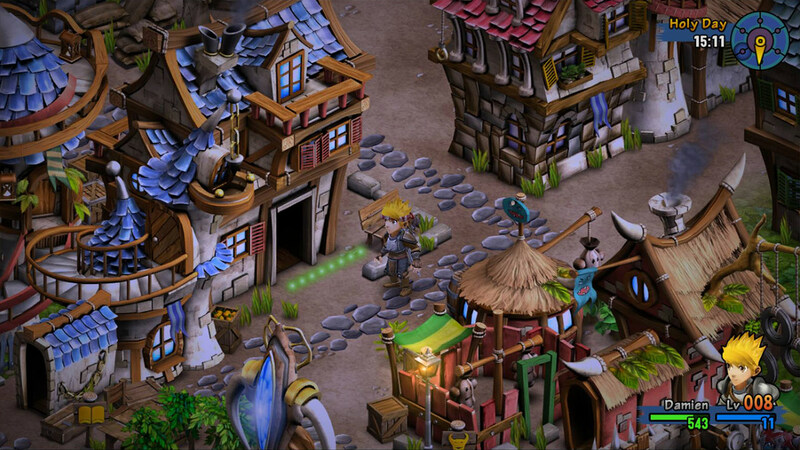 Rainbow Skies is a lighthearted tactical RPG that takes many of the best parts of modern peers and refines them into a fun adventure that’s easy to dive into. 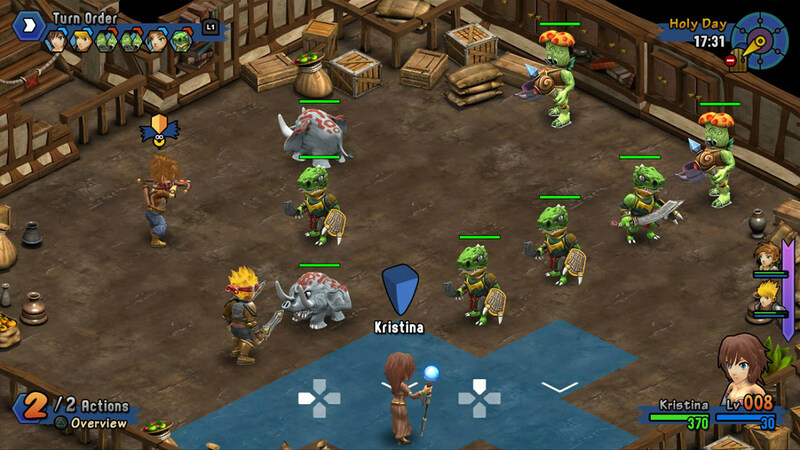 Developers SideQuest have certainly learned from their preceding game Rainbow Moon, as Rainbow Skies is a meatier, more engaging experience with characters who are far more fleshed out and interesting in an improved storyline that remains as quirky and unpredictable as we’ve come to expect from the Rainbow series. Our journey begins following hungover protagonist Damion, who is not even remotely ready for his monster taming exam as it rolls around, ultimately screwing up beyond belief and causing his friend Layne and himself to be lost and trapped in a foreign land, accidently and indefinitely bound to amateur spellcaster Ashly with no apparent way to return home. 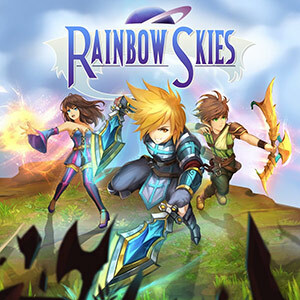 Rainbow Skies is irreverent and full of self-aware humor, with genre savvy characters who make learning the game’s mechanics both easy and fun. Most parts of the gameplay are explained well as you go, though I did find a couple of things confusing that weren’t explained until far later in the game. The biggest issue I had with the game’s explanations was regarding the food meter, which serves as a small damage buff when not empty but is implemented as if it was Rainbow Moon‘s food meter, which was more of a stat to manage and lead to debuffs if ignored. Players coming from Moon might be thrown off about the food system, and new players will wonder the purpose of it until 5-10 hours into the game when it is finally explained. Gameplay is pretty straightforward: you’ll be walking around a huge number of large individual maps, each of which is visually interesting and easy to distinguish from each other. Exploring these spaces is a major part of Skies, with hidden treasures tucked away in corners, waiting to be fished up, and even buried underground, ready to be found via following clues from purchased treasure maps and dug up. Areas often have a small village nearby, populated with the usual NPCs you’d expect — vendors, healers, innkeepers — as well as those serving as flavor, keeping the places feeling more lively with their quirky comments. You’ll often find important NPCs dotted around maps away from villages too, so you’re never usually in trouble. If there’s a troublesome fight ahead you can easily retreat back to a healer to restore health and magic points for wonderfully low prices, or to a nearby blacksmith to slot materials into your gear to enhance your stats for free. Outside of settlements monsters roam the map, typically patrolling simple routes waiting for you to walk into them to initiate combat. 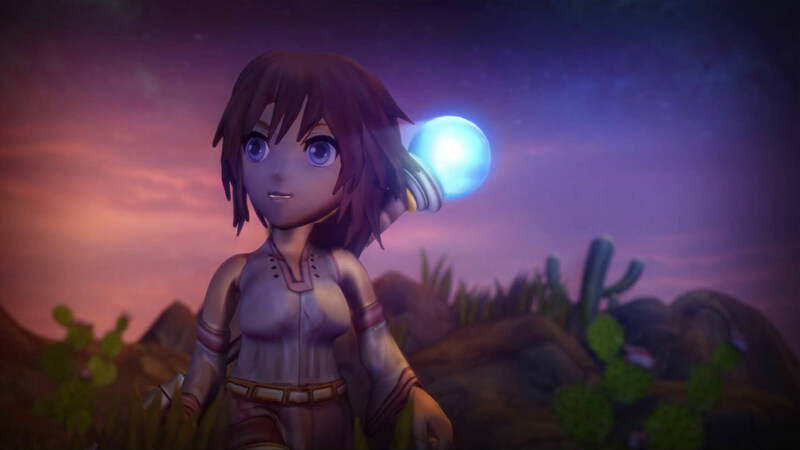 Rainbow Skies does away with random combat encounters by instead adding an “ambush” system, whereby random encounters will pop up in the corner as you explore and giving you the choice of whether you want to jump into that fight or simply ignore it. It’s a nice touch, giving you the option to grind monsters or just focus on your questing. If you’ve played a tactical RPG or turn-based action title, you’ll be familiar with how combat works in Rainbow Skies — you’ll transition to a separate battle screen with you and the enemies placed on the field. Each character will take turns in moving, attacking, consuming items or performing abilities such as healing allies or raining fire upon foes. Combat is isometric, meaning each direction moves your characters diagonally — pressing up will move a character diagonally up and to the side. This certainly takes a little time to get used to, especially as Rainbow Skies defaults to pressing up moving you in a different direction (up-left) than most other isometric titles (up-right), though this is easily changed within the options. Combat is fairly straightforward: Walking into an enemy attacks them, while spending magic points allows abilities like ranged attacks or pounces to be cast. Each character has a particular weapon class — Damion uses swords, Layne a bow, Ashly a magic staff — and every weapon class is strong against, and weak against, one particular other weapon type. Learning which types each enemy has and arranging your party to assault them effectively is often key to victory, particularly in tougher fights; a favorable match-up may deal hundreds of damage in a single strike, whereas a poor match can barely scratch single digits off of their health. You’re not stuck with just the three weapon classes for your party, however. As you progress you’ll learn the ability to raise and tame monsters who can be added to your party, bolstering your ranks with your choice of monster each with their own attack styles, weapon class, and abilities. There are a whole ton of monsters available that can be added to your roster, and while the process can be a little laborious the customisation it offers more than makes up for it. Indeed, some of the later bosses will require particular setups to take down, and if you’re not able to counter their abilities or make a dent in their health pools you’re going to struggle. Difficulty as a whole is a funny thing in Rainbow Skies, with the toughness of combat quickly ramping up as you progress through areas, which you can deal with in two different ways. 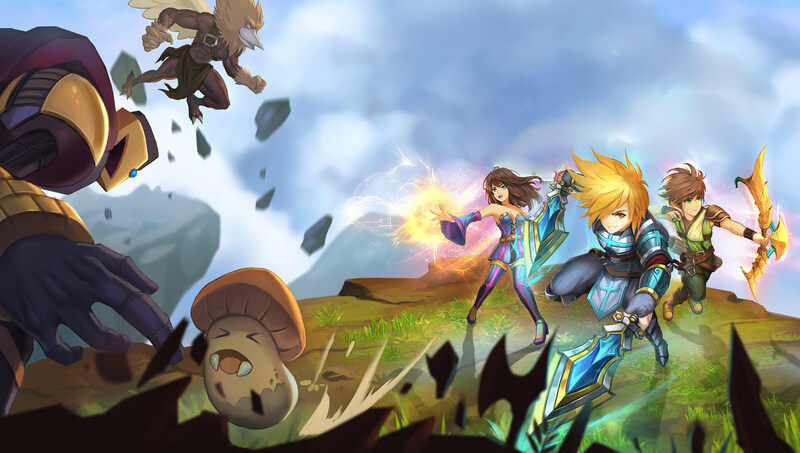 Firstly you can use the classic grinding approach, triggering as many fights as possible to grind experience points and skill stones, which are spent to upgrade stats such as strength, speed and health/magic pools. Alternatively, you can use one of Skies‘ strongest combat features which is battle rank: upon completing a set number of fights per battle rank you can visit an NPC to increase it further, which makes all enemies tougher but increases their loot drops and experience value. You’ll also collect keys related to battle rank as you level it up, which unlock new optional map areas and dungeons. While this can only be increased by travelling to a particular NPC, it can be reverted to a lower level at any time, so you won’t run the risk of hitting a wall and being unable to progress — one time I found myself unable to defeat an enemy ahead of me, and had no currency left to pay the healer to revive my fallen teammate; decreasing my battle rank level made the fight doable, and I was able to continue onwards.